Treasury yields took a steep dive on the news that the Federal Reserve will likely not raise interest rates this year. Fed Chair Jerome Powell’s words were the U.S. rates could be on hold for “some time.” The Fed did forecast one rate hike in 2020, but some analysts believe that could be a statement of strategy to keep economic reaction more stable. A 12-5 majority of Federal Open Market Committee participants do expect a rate hike by 2021. The 10-year Treasury note dropped eight basis points on Wednesday, to 2.526 percent, its lowest level since January of 2018. It then dropped again this morning, falling below 2.5 percent. The 5-year Treasury also took a dive, down 10 basis points to 2.328 percent which is its lowest level since February of last year. 30 year fixed-rates have followed this trend as well and are now .75 percent lower in rate than where they were in November 2018 when rates were north of 5 percent. To give you a better idea of what that means for a homebuyer, every .25 percent of rate reduction on a 30 year fixed-rate mortgage equates to approximately $50 per month savings on a $300,000 mortgage. As of this morning, the 30-year fixed mortgage rate average was sitting around 4.25 percent, saving approximately $150 a month on a $300,000 mortgage loan. The timing could not be better as we hit the spring homebuying season. Expect this low rate environment to continue for some time. 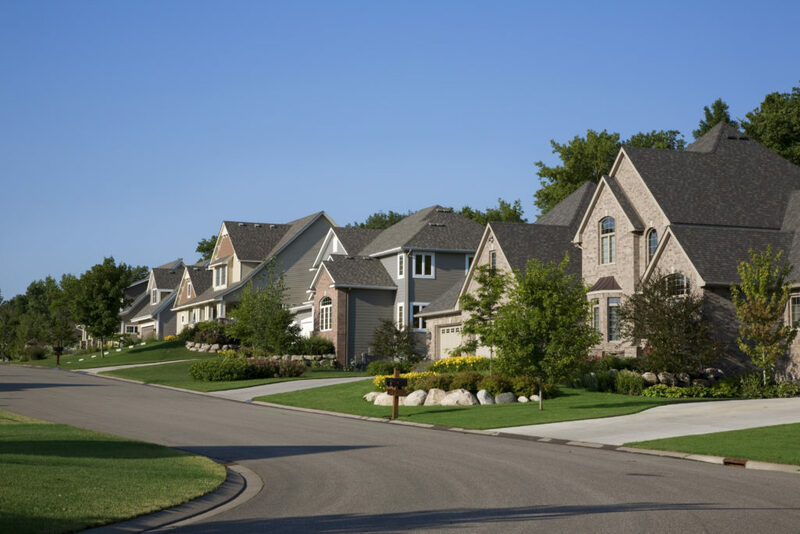 In their March housing forecast, analysts with Fannie Mae believe that the economic slowdown will hold interest rates right around the 4.4 percent range through 2019 as well as 2020. It’s interesting to note that while they are predicting the 2019 purchase total to be around $1.18 trillion, they also expect the refinance volume to be at $417 billion. Those numbers have been downgraded from projections one month ago. The Central Bank lowered its growth outlook for 2019 as well and will also end its balance sheet roll-off in September, which was expected. Economists from Goldman Sachs predict the balance sheet will stand at $3.75 trillion after the runoff with reserves sitting at $1.3 trillion. Powell continued to stress this week that he believes the economy remains strong, however there are some key economic indicators that show a different story. The chart below from CNBC shows how the yield curve between the 3-month and 10-year Treasury notes has shifted over the years. You can see it slowly starting to become flatter and then start to invert. This week, for the first time in 12 years, that yield curve dropped below 0.1 percent, or 10 basis points. We have not seen it go to that level since September of 2007. This specific ratio between the 3-month and 10-year yields is one of the more reliable economic health indicators for economists. If that curve goes beyond flat and inverts, that is a key indicator of a recession. Tightening from the Fed has also had a big impact on the United Kingdom’s economy as the U.K. saw its 30-year gilt yields dropping to lows that hadn’t been seen since 2016. On Thursday those gilts dropped seven basis points to 1.56 percent. The Bank of England kept its rates unchanged this week despite the chaos. After two years of negotiations, Brexit is still shaky and it’s possible the government could be forced into another general election. Essentially, it would be a do-over of the original Brexit vote. The trade negotiations between the two countries are ongoing and Trump said that the deal “is coming along nicely.” The trade deadline was extended as discussions continue next week in Beijing. U.S. Trade Representative Robert Lighthiser and Treasury Secretary Steve Mnuchin will travel to China to continue working out a deal. Right now, the U.S. is imposing tariffs on $250 billion worth of Chinese imports while China is executing duties on $110 billion in American imports. There are many conflicting media reports about what is actually happening in the trade discussions. 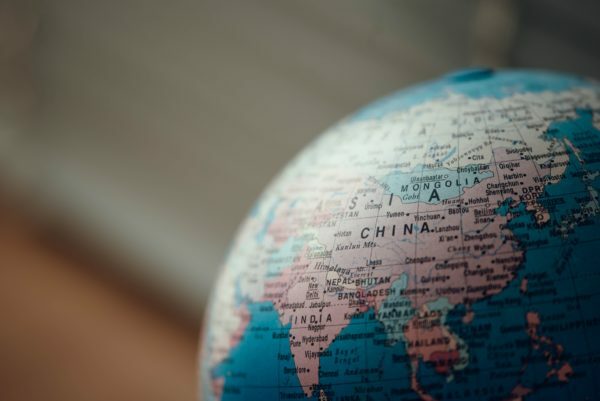 Bloomberg reported that China had backed off of certain concessions while The Wall Street Journal said that trade talks are in their final stages. The Labor Department says initial claims for state unemployment benefits dropped last week by 9,000 to a seasonally adjusted 221,000. Also, data for the week before was adjusted up to show 1,000 more applications received than previously reported. 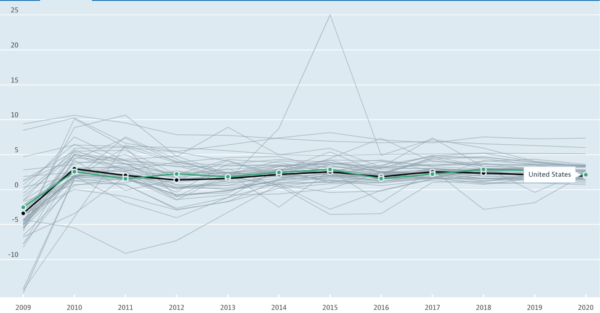 The chart below from the Organization for Economic Cooperation and Development shows the United States’ GDP growth (green line) from 2009 to predicted growth in 2020. You can see the sharp increase from 2009 and the steadiness that has followed, even into 2020 predictions. As I’ve said before here, slow, steady growth is nothing to be upset about. This may not be moving markets right now, but the Department of Housing and Urban Development is greatly impacting the way that businesses target potential homebuyers on Facebook. Directly after the complaint was filed, Facebook said it was overhauling the system and removing thousands of ad target options. After the settlement was reached on Tuesday, Facebook went a step further and now prohibits advertisers from targeting housing, employment and credit ads by age, gender or zip code. This will definitely change the way that Realtors and loan officers advertise their services and it will be interesting to see if it has any effect on the market as a whole.